This course will introduces the teachings and movements of Joseph H. Pilates. It outlines the popular neuro-muscular floor exercises that stretch and strengthen muscles and promote better posture. The focus is on using science to better understand the core and stabilizing techniques used in this type of training. 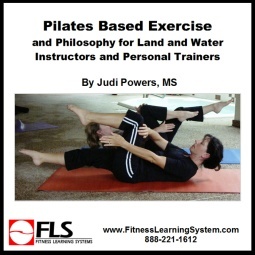 be able to describe Pilates Principles. be able to explain the function of the transversus abdominus, lumbar, multifidus, mid and lower trapezius during the following exercises: abdominal curl prep, single leg circles, prone extension exercises, and the rotational exercises such as the saw or spine twist. be able to discuss two key points to help cue and teach using visualization, and the function of breath work during specific exercises such as the breath in roll up, the pelvis in single leg stretch, the cervical region in the hundred, and the scapular area in the swan dive – prep exercise. be able to explain the goals of five exercises from the beginning level. be able to demonstrate proper development of progression using the Hundred exercise. be able to match the primary muscles used with 12 Pilates Mat exercises. be able to briefly explain the history of Pilates. be able to discuss the populations that could benefit from a Pilates exercise program performed in the pool. be able to create a class format with 12 moves: incorporating a group of warm up exercises, heat building exercises and cool down stretching for an apparently healthy population.